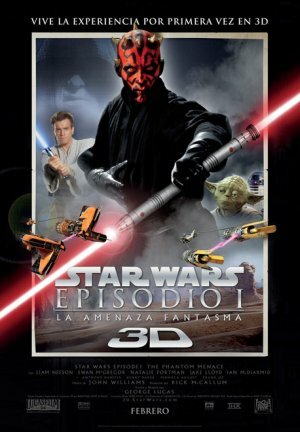 Título original: Star Wars: Episode I – The phantom menace 3D. Liam Neeson (Qui-Gon Jinn), Ewan McGregor (Obi-Wan Kenobi), Natalie Portman (Reina Amidala/Padmé), Jake Lloyd (Anakin Skywalker), Ian McDiarmid (Senador Palpatine), Pernilla August (Shmi Skywalker), Oliver Ford Davies (Sio Bibble), Hugh Quarshie (Capitán Panaka), Terence Stamp (Valorum), Keira Knightley (Sabé), Ray Park (Darth Maul), Samuel L. Jackson (Mace Windu). George Lucas (Dirección), Ben Burtt, Paul Martin Smith (Montaje), David Tattersall (Fotografía), George Lucas (Guión), John Williams (Música), Rick McCallum (Producción), Trisha Biggar (Vestuario).